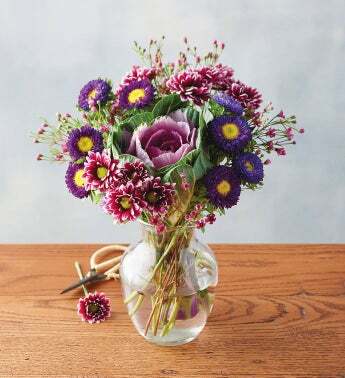 A stunning collection of rich purples interspersed with soft pinks and yellows, this lush bouquet is a gorgeous addition to the home. Included in the arrangement are three purple matsumotos and purple wax flowers, two purple poms, and one gorgeous purple brassica, all sustainably grown the U.S. Comes with flower food for long-lasting blooms. Whenever you see this symbol, you'll know that all of the ingredients are grown and made in the USA, including vases and containers.